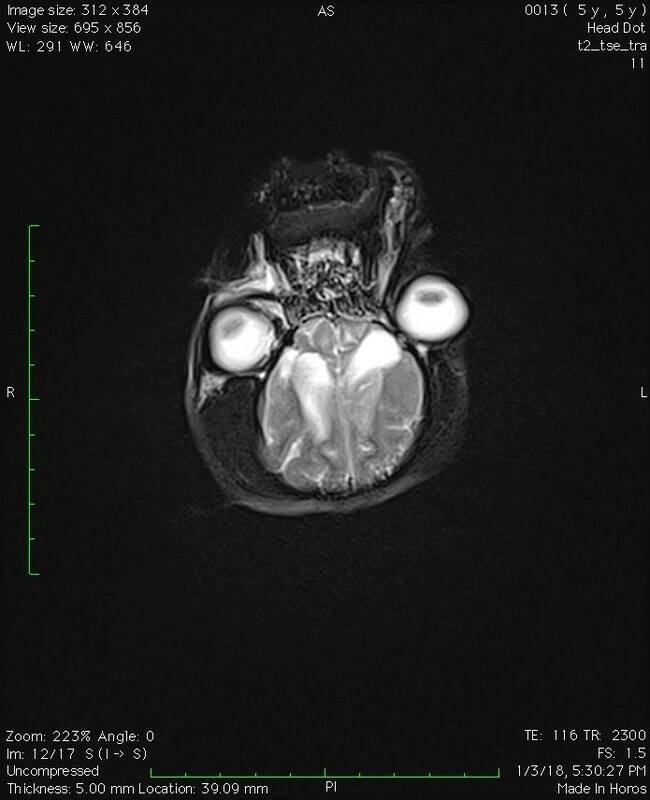 Case presentation: a 3 and a half year old female pug dog was presented at the Bluecross Veterinary Clinic in Sofia for additional diagnostics in view of resently started seizure events. 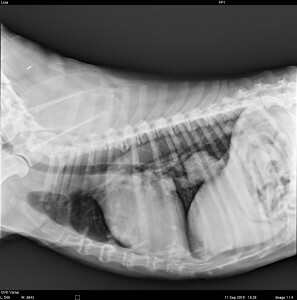 A month ago the dog started having problems with its hind left limb and another vet started him on prednisolone. The limping improved but 20 days later the dog started having seizures. 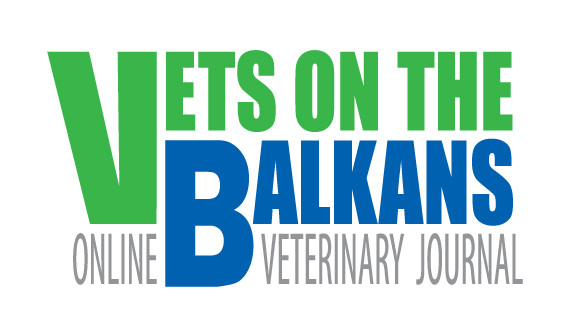 The patient was examined at the Bluecross Veterinary Clinic in Blagoevgrad within two hours after one of the seizures. At that stage the dog wasn‘t able to see properly and showed a tendency to circle to the left. 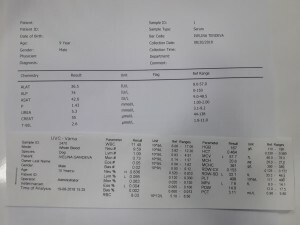 Blood was taken for Cbc and biochemistry analysis and the results were normal. 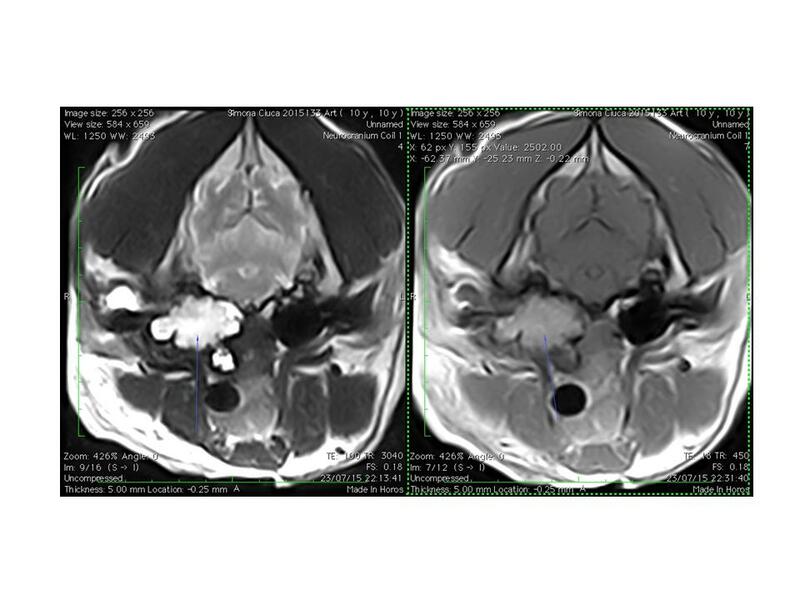 The patient was started on an antiepileptics drug – Phenobarbital and the steroids were continued (because of the high possibility of an inflammatory process). An examination at the clinic in Sofia and additional advance imaging were scheduled. 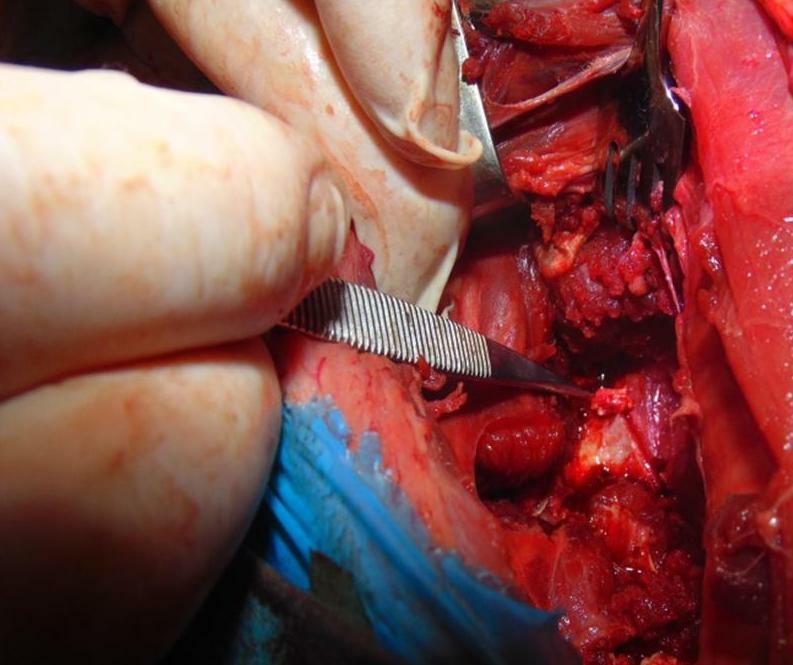 good general condition, slight difficulties in breathing (because of the brachiocephalic syndrome), normal heart and lung sounds, normal temperature. Neurological examination: a little overexcited behaviour (but it was impossible to tell if this behaviour was abnormal for the dog or not). 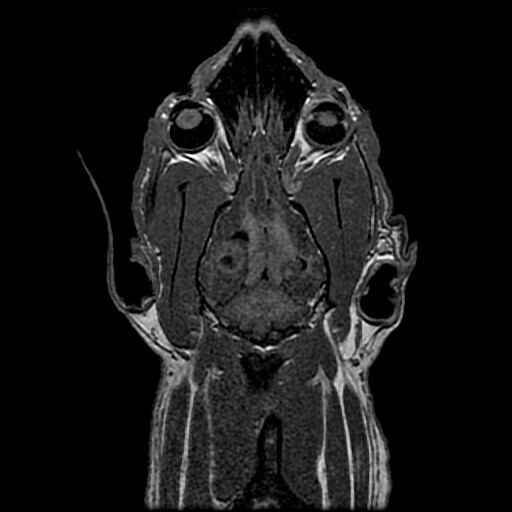 Normal cranial nerve reflexes, no nysgmus or circling, normal pupillary light reflexes. 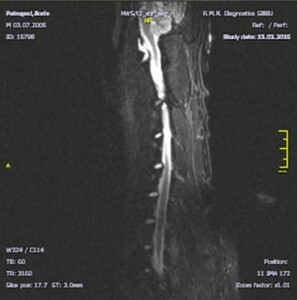 There was slight spinal ataxia in all four limbs. 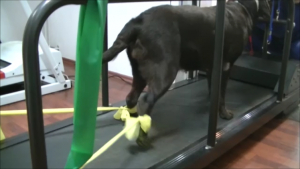 The proprioceptive tests were normal on all four. 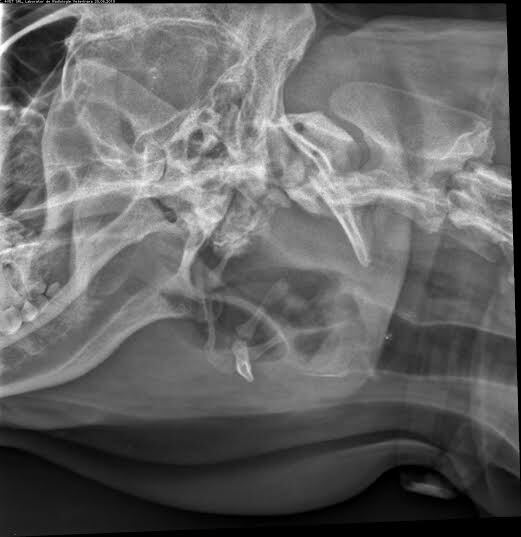 On the hind left limb the dog has pattelar luxation second degree (this explains the limping epizode a month ago). From the video provided by the owner it could be observed that the dog was demonstrating clonic- tonic seizure. The owner was questioned for possible toxins, drugs and plants that could be the reason for the seizures but he said that the dog couldn’t have eaten anything abnormal. 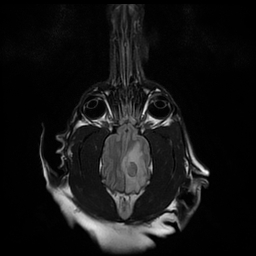 A forebrain lesion was localised but the possibility of a multifocal process was very high. The blood results were normal; therefore, possible extracranial reasons for the seizures were excluded. Toxin exposure was excluded by the anamnesis. 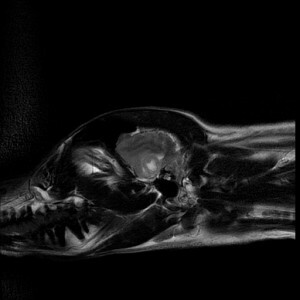 To exclude most of the diagnoses from the list, advance imaging was performed – MRI 1,5tesla was used. The test was done with and without contrast material. 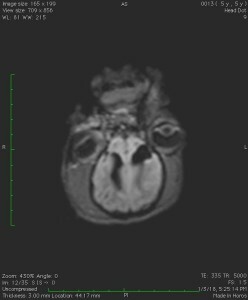 On the MRI we discovered a bilateral enlargement at the cranial part of both lateral ventricles within the frontal lobe of the brain. 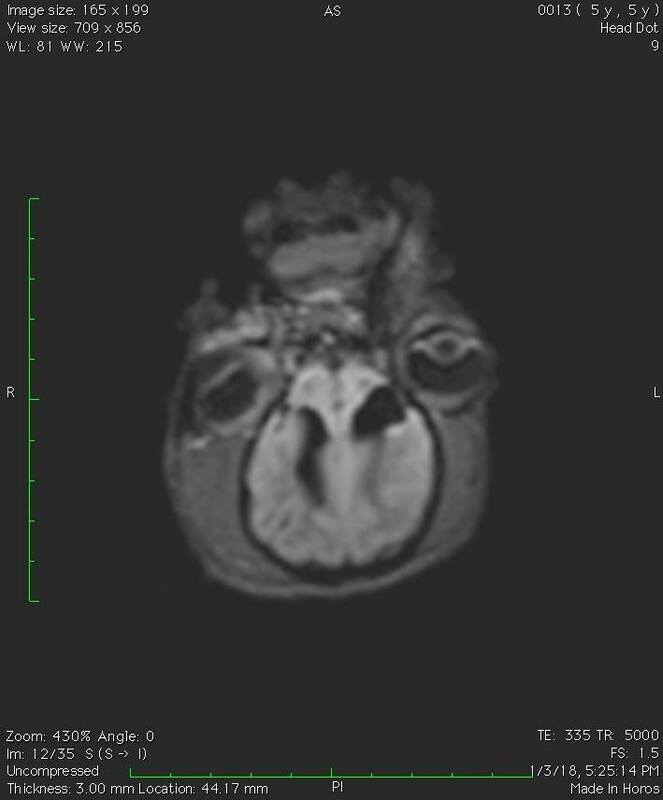 There was a visible communication between the ventricles and the subarachnoid space at the level of the eyes. They looked like cystic lesions filled with CSF. Bilateral loss of brain tissue was observed in both hemispheres. Around the cavities the cerebral cortex was reduced. 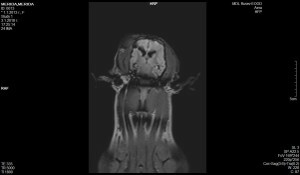 These bilateral lesions could explain all the clinical signs that this dog was showing – seizures and the ataxia of all four limbs. There are motor cortex within the frontal lobe of the brain. 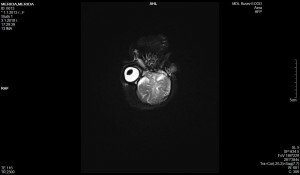 There was no contrast enchantment after injection of contrast material within the brain tissue. Therapeutic plan: the dog antiepileptic treatment was continued and regular measurements of the level of phenobarbital were scheduled. I added proton pump inhibitor –Esomeprazole (S enantiomer of omeprazole) because the drug has the effect of reducing the cerebrospinal fluid production. The steroids are slowly taped and they will be discontinued after two weeks. 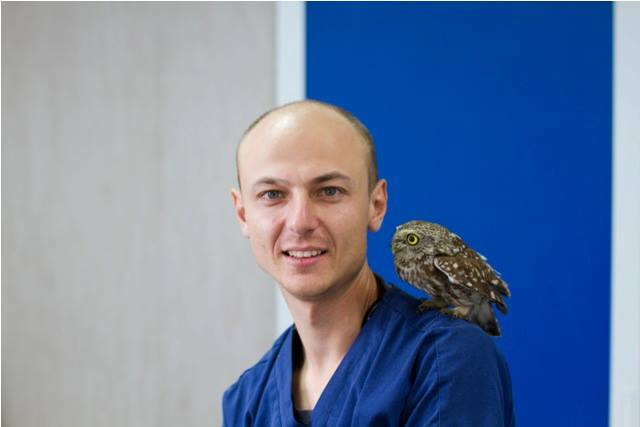 The dog’s condition will be monitored by the owner and the vets at the BlueCross Veterinary Clinic in Blagoevgrad. 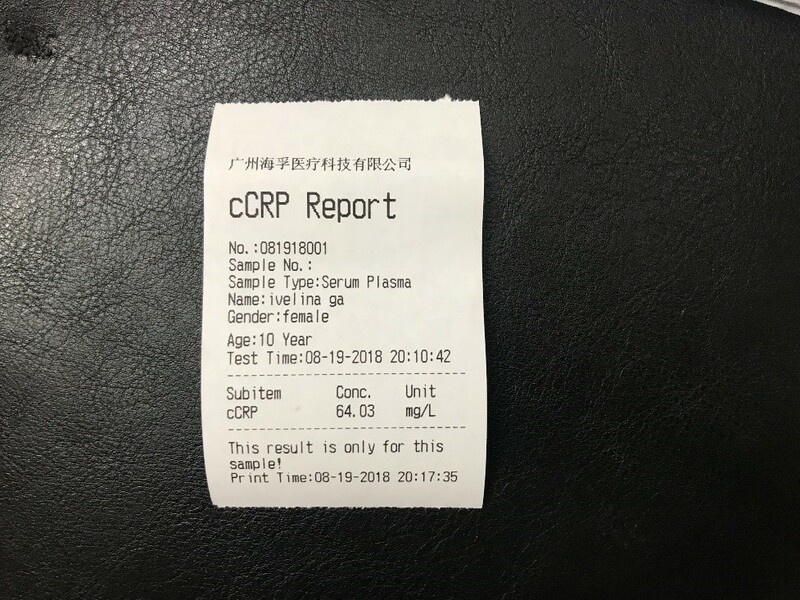 In case of progression, especially after we stop the steroids, the necessity to take a CSF sample in order to finally exclude an inflammatory process is being discussed with the owner. Porencephaly is a rare congenital cerebral defect and it is described in several reports in the field of veterinary medicine. It is more commonly seen in ruminants but there are few reports about dogs and cats. 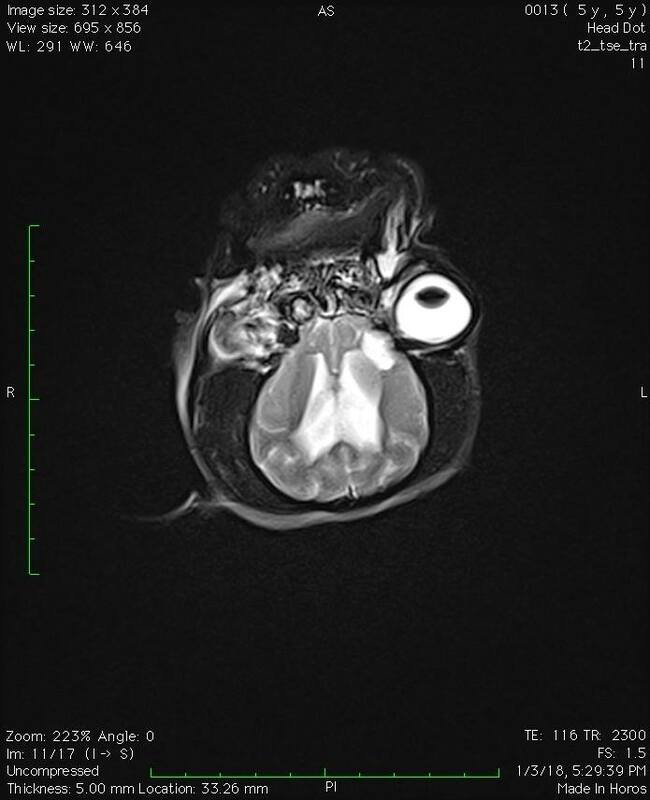 There are few cystic congenital lesions of the brain, including focal lesions (porencephaly), extensive lesions (hydranencephaly) and very rarely schizencephaly (more commonly seen in humans). 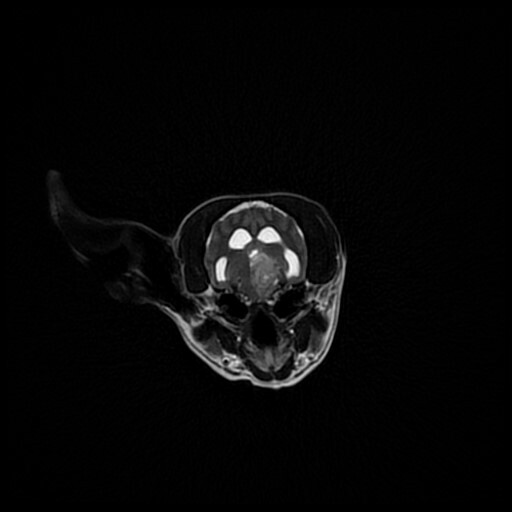 In porencephaly the defect creates a communication between the lateral ventricles and the subarachoid space. In schizencephaly the defect may be surrounded by a ring of polymicroglia. 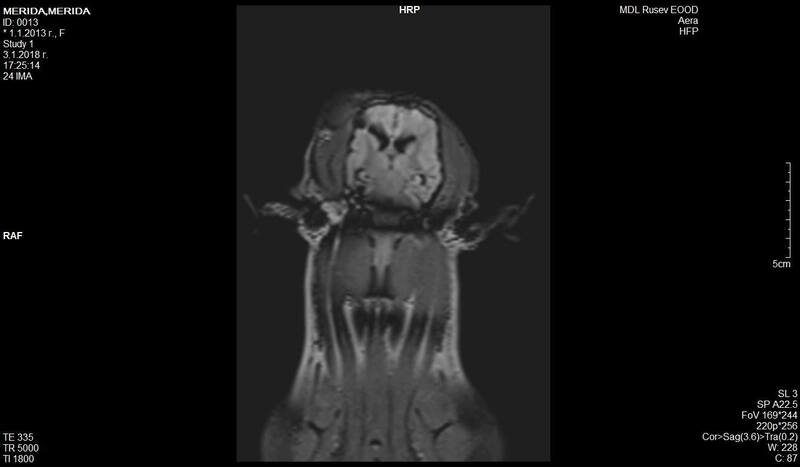 The schizencephalic defects are lined by gray matter. The most frequent classification of these lesions based on their pathogenesis divides these defects into two major categories: developmental and encephaloclastic. Developmental porencephaly is due to a focal neuronal migration disorder, leaving a gap in the developing cerebral hemisphere. 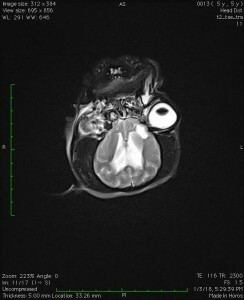 Encephaliclastic porencephaly includes cerebral cavities that result from tissue breakdown of various etiologies (cerebral ischemia, infection, trauma). In utero infection is the most common reason, especially in ruminants. The interesting thing is that this type of lesions are congenital in nature but the clinical signs can start after the birth of the animal (which should be expected from the age) or sometimes later in life (after a few years). According to the few reports about this type of pathology, the progression of the disease is different in every case. Some of those are completely asymptomatic, other cases are well controlled with drugs (antiepileptic drugs) third – their condition worsened, with poor control on drugs and some of those were euthanized. 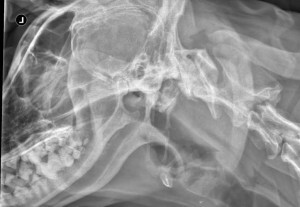 There was one report on a case of hydranencephaly where a ventriculoperitoneal shunt was placed and the dog’s condition slightly improved. Therefore, this is also a therapeutic option in some of those severe cases. X-rays: There is thickening and destruction of the right tympanic bullae. There is marked swelling of the soft tissues of the right aural region. 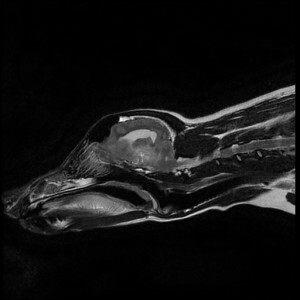 The external ear canal is obliterated and there is calcification of its inner end. 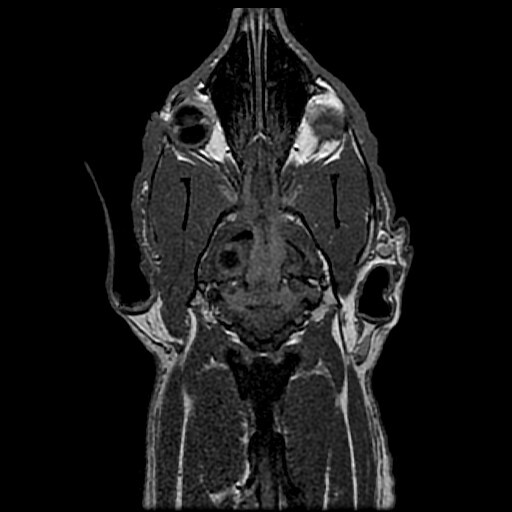 MRI: There is a well-demarcated, expansile mass in the right tympanic bulla, with remodeling and destruction of the right tympanic bone. The right petrous temporal bone and the right inner ear are unclear indicating erosion from the mass. The right external ear canal is not visible. 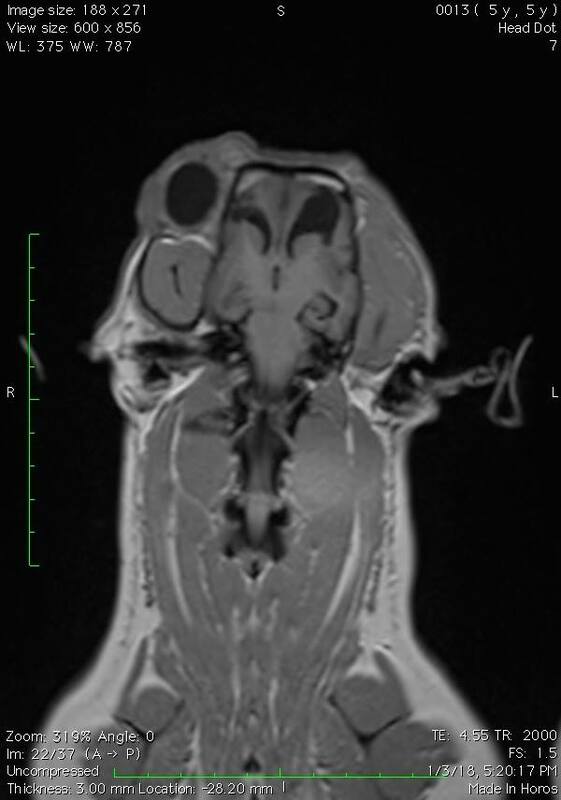 The muscles and tissues on the right side appear markedly hyperintense and there is a fluid filled cavity approximately 6 x 4.4 x 1.9 cm that appears to continue cranially and communicate with right tympanic bulla. 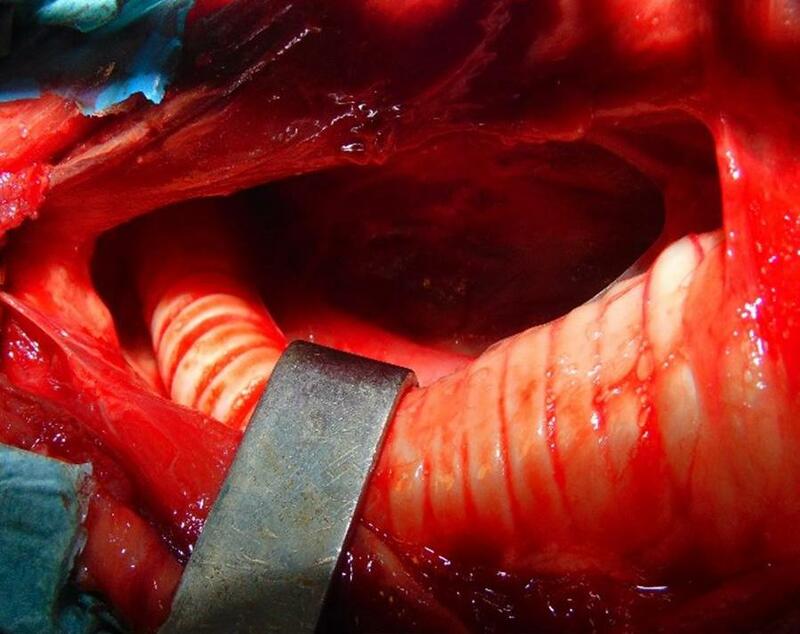 This cavity extends from the level of the tympanic bulla and caudally up to the level of the C2 vertebra. 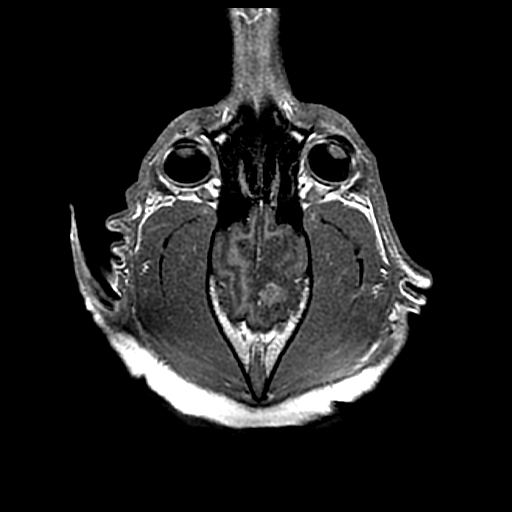 The right mandibular salivary gland appears displaced medially from the cavitary lesion. mass in the right tympanic bulla is consistent with cholesteatoma. Erosion of the right petrous temporal lobe and possible involvement of the inner ear is visible. 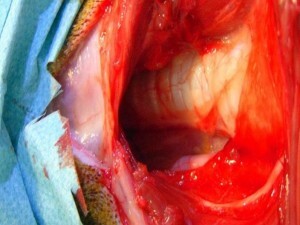 Cystic lesion may reflect abcess or haematoma. Cholesteatoma, a destructive and expanding growth, in the middle ear and/or mastoid process, is a relatively rare cause of otitis media in dogs. Cholesteatoma are epidermoid cysts lined by a pluristratified keratinizing epithelium containing keratin debris and is characterized by independent and progressive growth, causing destruction of adjacent tissue, especially bone. 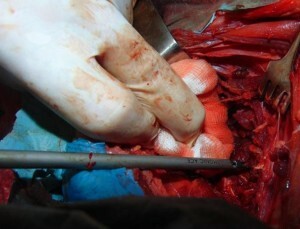 Fibrocartilagenous embolism it is a spinal cord infarction caused by a vascular emboli, presumed to be fibrocartilage. 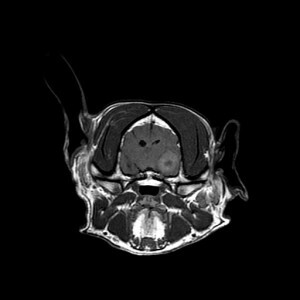 It may produce bilateral or unilateral signs and can happen anywhere in the spinal cord, the thoraco-lumbar region being the most common. Usually it has a sudden onset and a full development in 12 hours. There are 50% chance of spontaneous recovery if it shows signs of improvement within the first week. 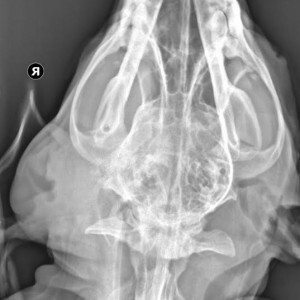 It is a nonpainful acute disease, seen only in nonchondrodystrophic breeds. It is very important to differentiate from the intervertebral disk disease, either protrusion or extrusion. This condition is less common in small dogs or cats. 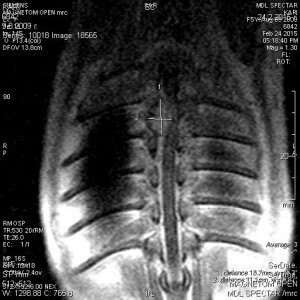 Any region of the spinal cord may be affected, and the spinal cord segments dictate the specific neurologic deficits. 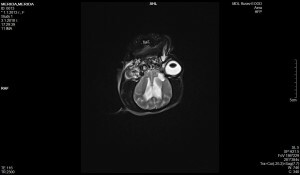 Very common are also asymmetric or unilateral signs. Also, ataxia, paresis or paralysis may affect all limbs or only pelvic limbs. There can be a loss of deep pain sensation caudal to the lesion. Diagnosis is based on the clinical picture and by exclusion of other possible causes. The most important clues are the signalment, the acute onset, the stationary course of the disease and the absence of pain. 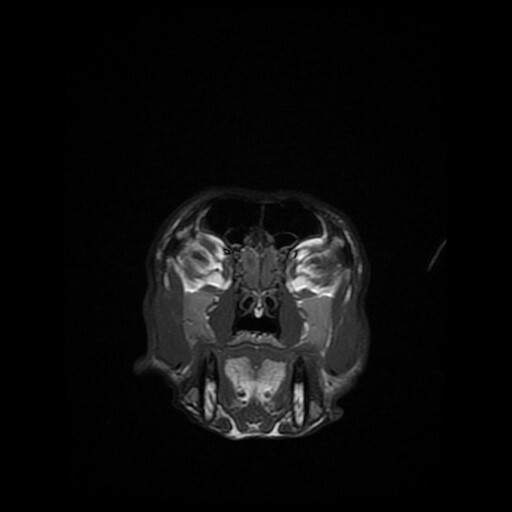 The differential diagnosis include intervertebral disk disease, trauma, neoplasia and inflammatory disease. 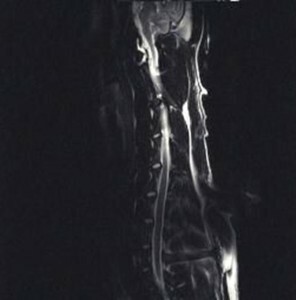 The best imaging modality is the MRI showing usually signal changes suggestive of focal spinal cord infraction. 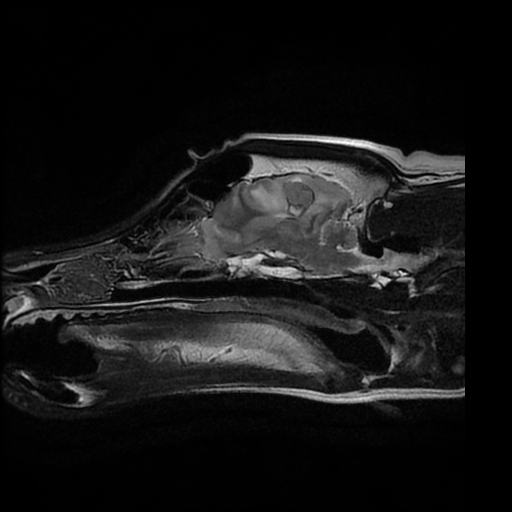 There isn’t any specific treatment for this condition even though corticosteroids are used, but there is a lack of scientific evidence that they might work. 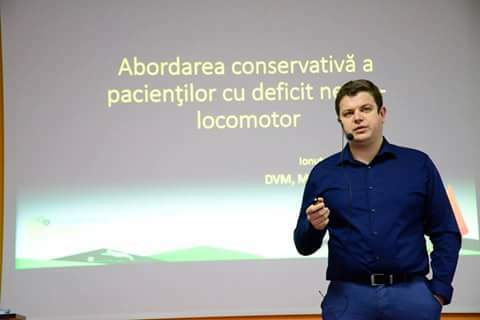 Physical therapy and nursing care are the most beneficial treatment modalities to use; about 85% of the patients recover, depending of the severity of the lesions (De Risio and others, 2007). 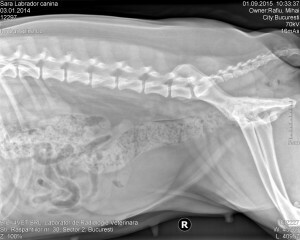 Sara it is a 2 years old intact female Labrador retriever with a sudden onset of paraplegia; the disease started with a lameness of the left hind leg, then with a proprioceptive ataxia and in 2 hours she was already paraplegic. 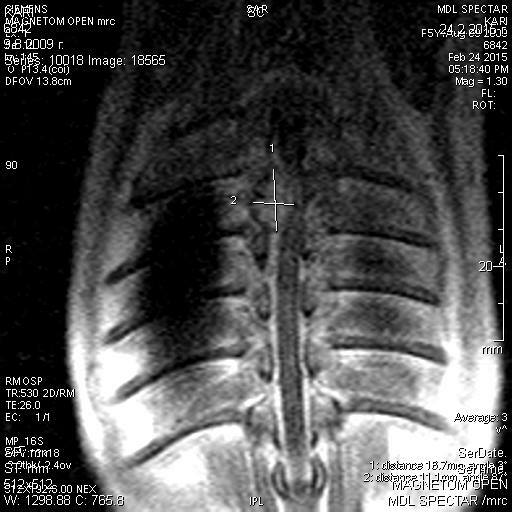 Sara did an MRI immediately which revealed a unique hyper signal medullary lesion of about 3 centimeters localized at the level of L2-L3 intervertebral disk. 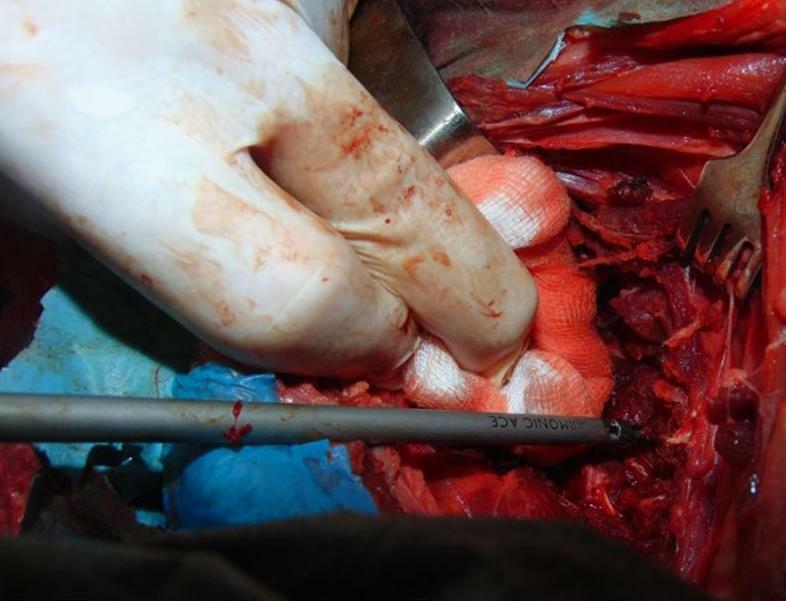 The lesion was consistent with a vascular disorder caused by a fibrocartilagenous emboli. Sara started a therapy with corticosteroids for a week and also vitamins and antioxidants. The second day after the incident she started also rehabilitation. 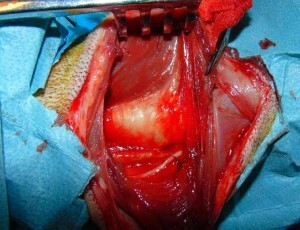 At the first visit the patient was paraplegic with no deep pain sensation and also incontinent. The spinal reflexes were present and normal and the cutaneous trunci reflex was lost at the level of L3 – L4. For the first sessions she did transcutaneous electrical nerve stimulation for 30 minutes followed by class IV laser therapy, 8 – 10 joules per square centimeter. After that modalities we started static balance exercises on the peanut shaped physio roll and reflex exercises on the proprioceptive plate. 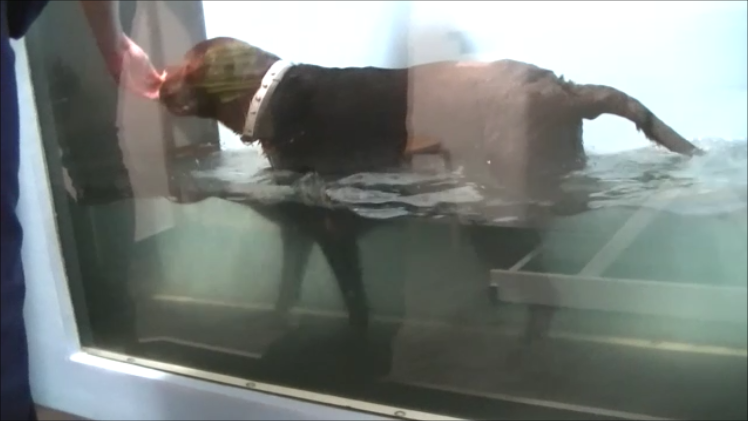 We introduced also the underwater treadmill but she was not able to move the hind legs. For the home exercises we recommended to the owners to perform passive range of motion exercises and assisted standing followed by weight shifting exercises, 2-3 times a day; also, we instructed them to try the flexor – reflex exercise. The sessions were performed twice a week and after 10 days she was already able to maintain the standing position on her own, and also started to show some motion in the hind legs. After 5 sessions she started to perform walking in the underwater treadmill; for the home exercise we instructed the owners to start with assisted walking exercise and more weight shifting and balance exercises. After 6 sessions she became ambulatory but with severe proprioceptive and motor deficits, so we introduced also ground treadmill with incline and then with resistive elastic bands. We increased the time spend in the underwater treadmill up to 25 minutes and also, gradually, we introduced cavaletti rails and weave polls exercise. For the home program she had to walk assisted on inclines, on stairs, on sand and grass, and also to start sit-to-stand exercises. After 12 sessions, Sara is now ambulatory with mild proprioceptive deficit on the left hind leg at walking, and a little bit more uncoordinated at trotting and turning. The strengthening exercises were increased with more resistive elastic bands on the ground treadmill and with more speed on the inclines, and of course with higher speed and lower water in the underwater treadmill. 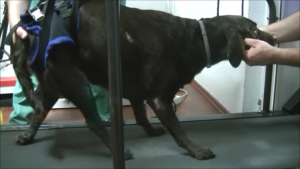 She is still doing rehabilitation because we need to correct all the proprioceptive deficit, as much as possible, and also to increase the muscle mass in the hind legs. We are also very happy because during the rehabilitation we were able to reduce her weight with 6 kilograms, from a body condition score of 8 out of 10 to a 6 / 10. 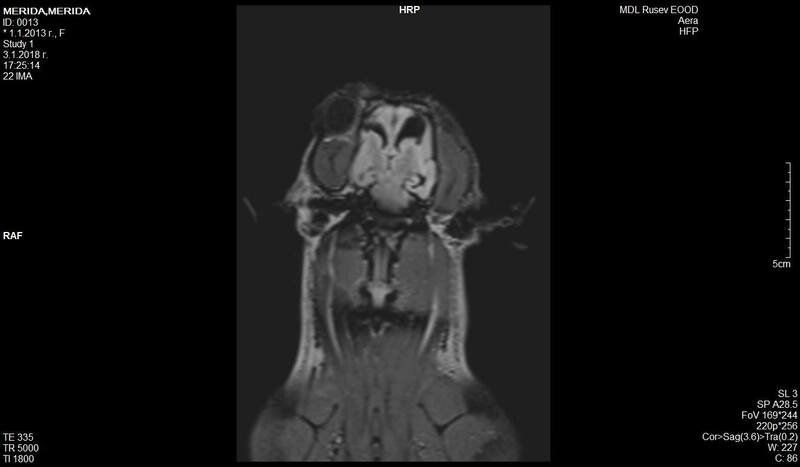 Neurofibrosarcomas are malignant nerve sheath tumors that are type of soft tissue sarcomas. They are usually discovered in the peripheral nerves ( most commonly the nerves that are forming the brachial and lumbosacral plexus ). 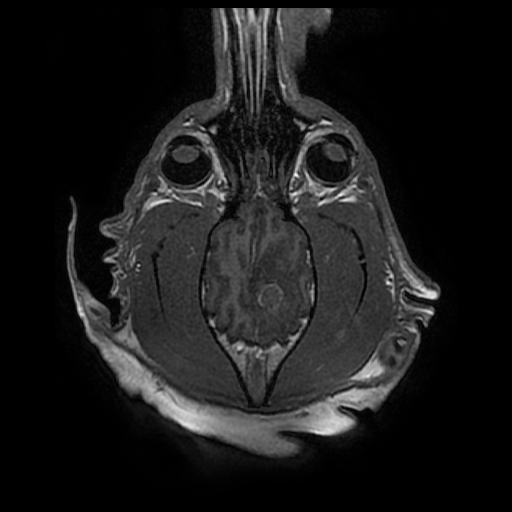 Sometimes they could be discovered in the cranial nerves ( trigeminal, vestibulocochlear ). These tumors are arising from perineural fibroblasts or Schwann cells. They are slow growing and usually locally invasive but are unlikely to metastasize. 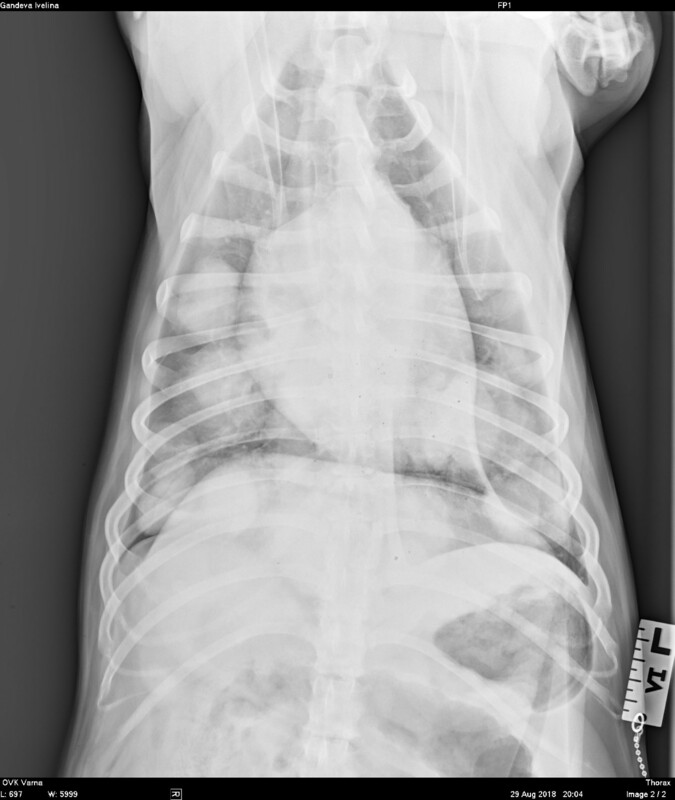 5 -years old female dog , Miniature Poodle , was presented for clinical examination. The dog had a long lasting history of difficult movements of the hind limbs. The problem started about 2 months ago, at the beginning only with one limb lameness. 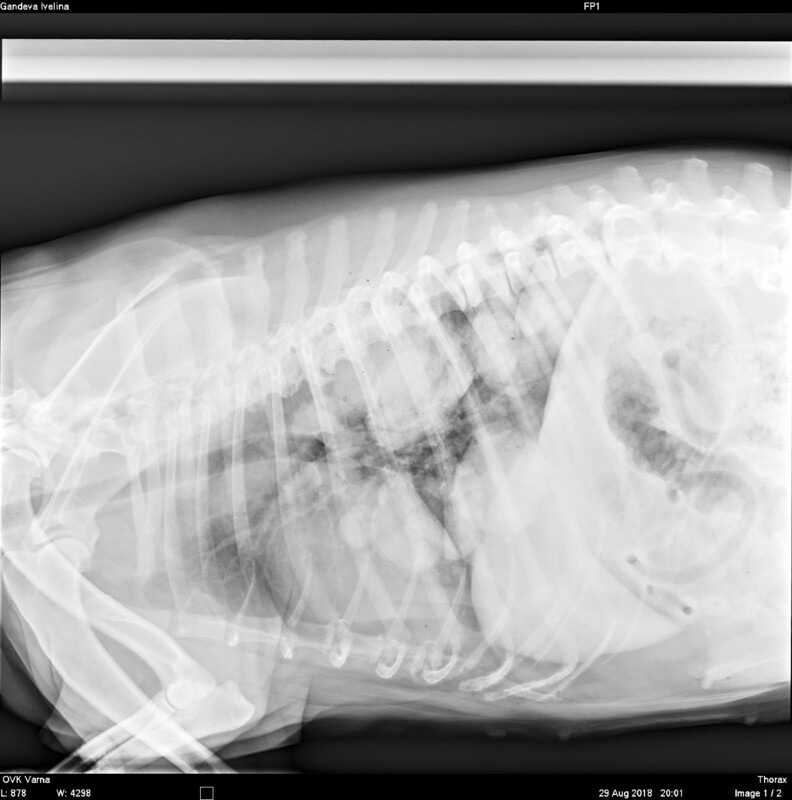 The dog had work-up done this problem , including CBC , biochemistry analysis, UA , X-ray, ultrasound of the abdomen and CT of the spine, but not clear visible reason for its condition was discovered. 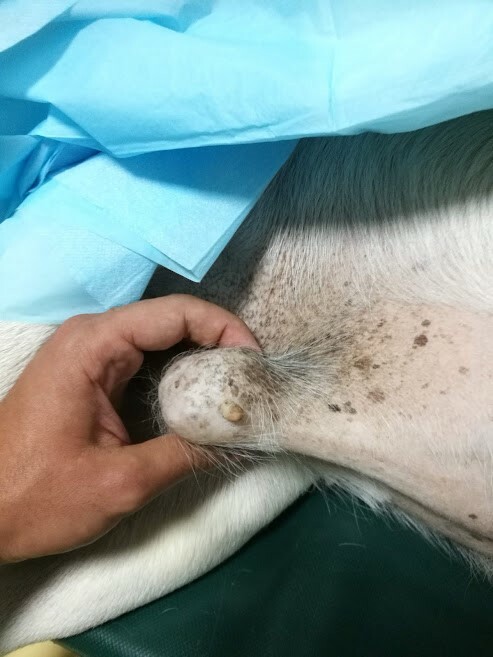 The dog was treated with several drugs, including NSAID , antibiotics, Steroids and Nivalin ( Galantamine hydrobromide ) , but without any successful results. 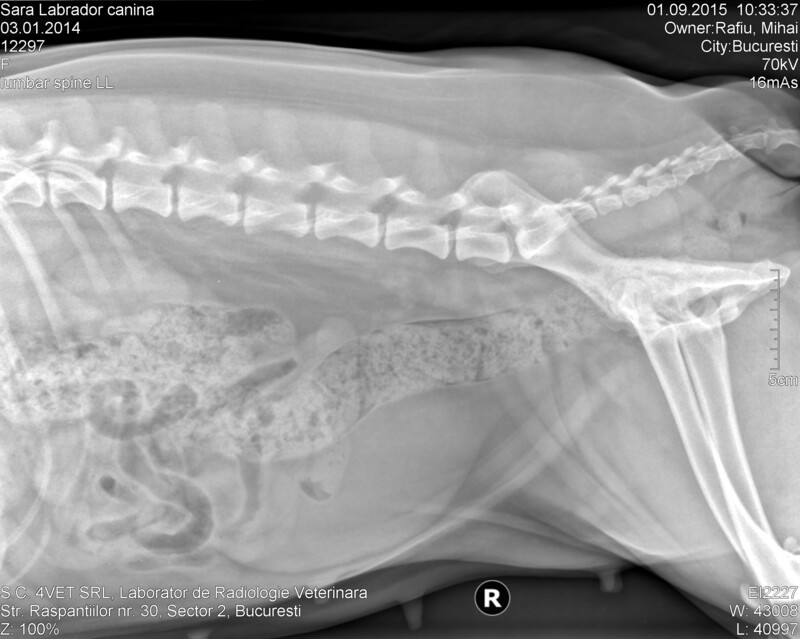 The dog in general condition , with normal temperature and mild discomfort on palpation on the abdomen. 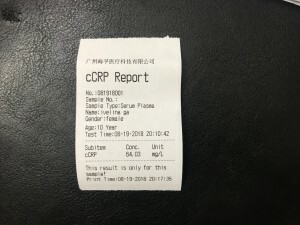 On the neurological examination : alert mental status, normal cranial reflexes, paraplegic patient, with increase patellar reflexes, and present withdrawal reflexes. 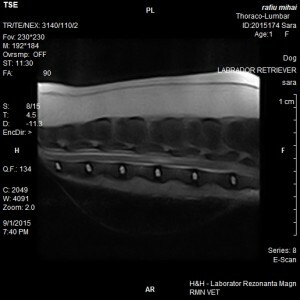 There was a mild spinal pain over the spine, localized at the thoracic part of the spine around Th7- Th10 vertebra. The urinary bladder was distended and very hard to express. 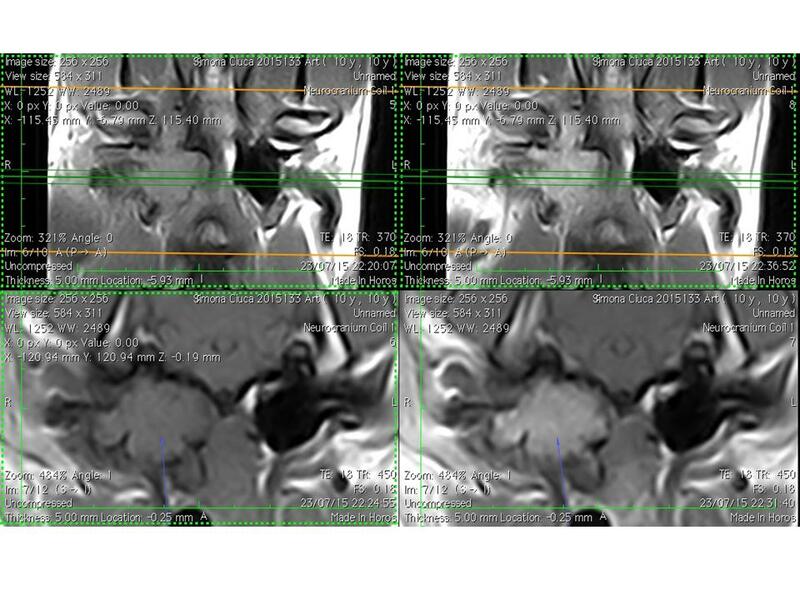 The problem was localized Th3-L3 area of the spinal cord ( Th3-L3 myelopathy ). 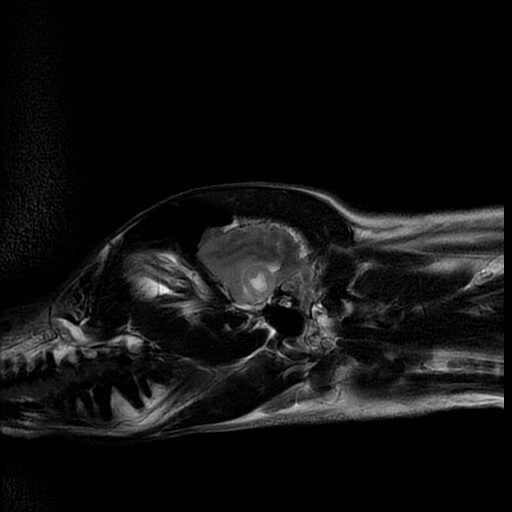 The most probable diagnosis that could explain the patient’s condition are : intervertebral disk disease and spinal neoplasia . 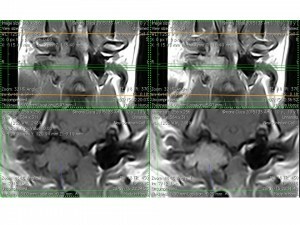 Treatment with Prazocin and Bethaneochol was started in order to improve bladder expression and MRI examination was scheduled. 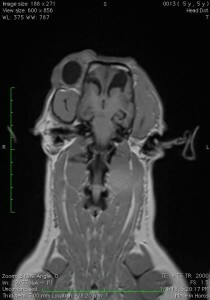 With MRI examination was found an ovoid , intradural, extra medullary mass with size 19/11.2 mm that is severely compressing the spinal cord at the level of Th7-Th8. 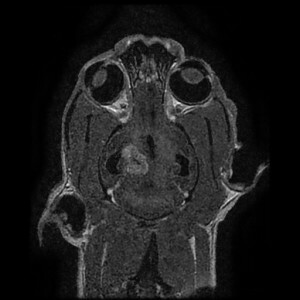 The mass is slightly hyperintensive on T1 and is located on the right side of the spinal cord ( Pic. 1 ) . 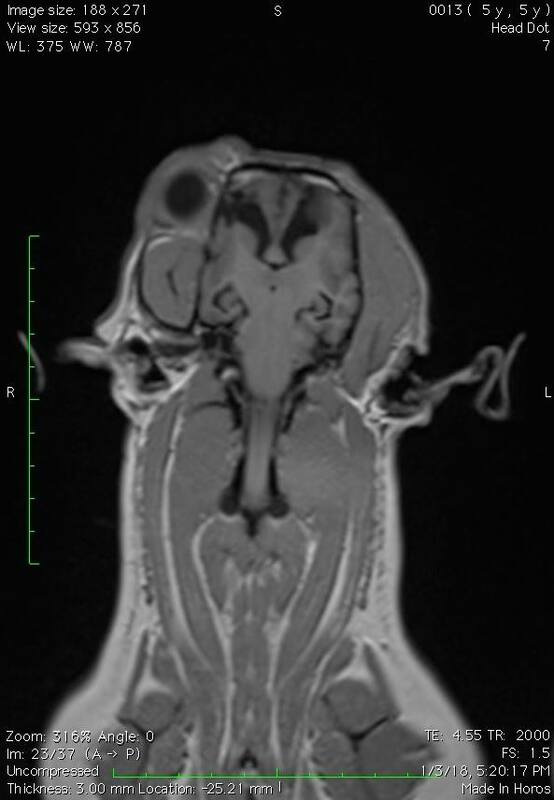 After MRI examination the dog lost its deep perception and on the next day was scheduled for surgery. Before the surgery CSF was collected for analysis but the content of the protein and the cell count were normal. The dog had a dorsal laminectomy on the level of the arch of Th7-Th8 vertebra. 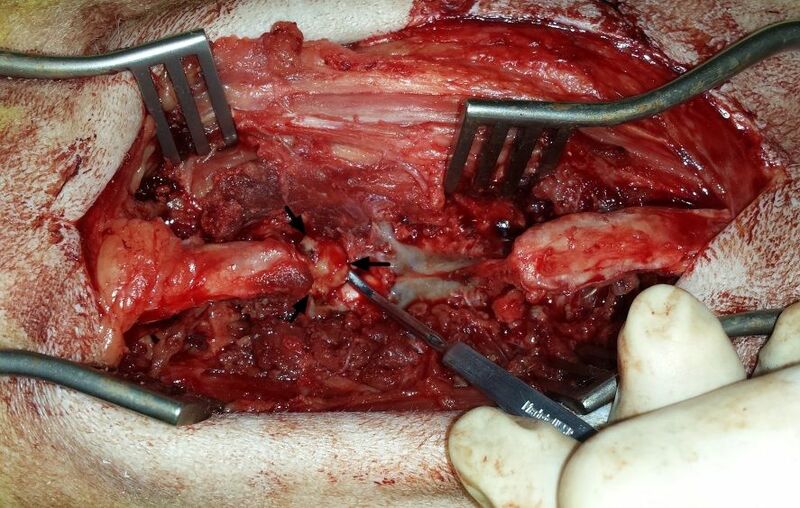 After opening the spinal canal , a firm, white mass around 15 mm was discovered. ( Pic.2 – black arrows ). 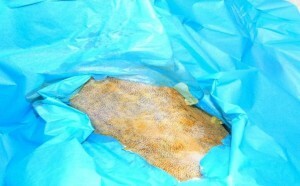 After being fully removed , the mass was send for a histopathological examination. 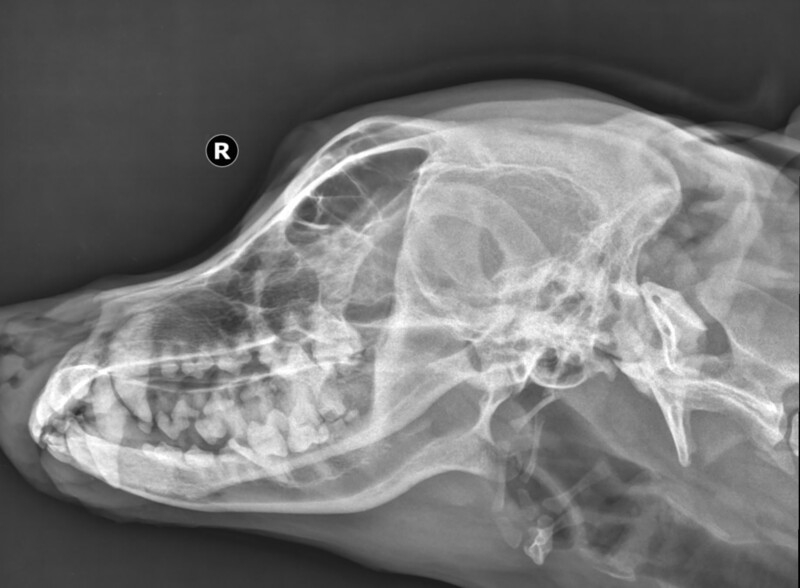 In the post surgical period the dog had painkillers – Morphine/Ketamine/Lidocaine mixture for 5 days and intravenously administrates antibiotics. On the next day the dog regained its deep perception. 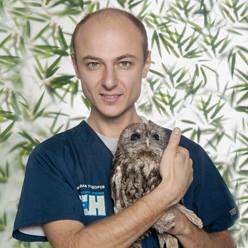 On the day of its discharge from the hospital it had little movements of its hind limbs and no problem with urination. 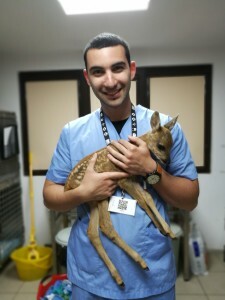 The owner was adviced about some rehabilitation techniques that he could do at home with the dog and treatment with antibiotics and NSAID was extended for another week. 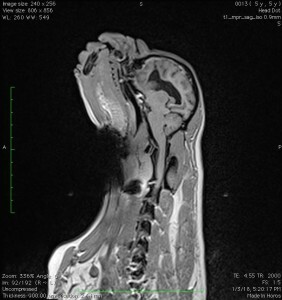 Two weeks later the patient was much better with slight ataxia and a week later – completely normal. 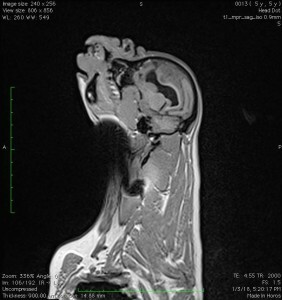 The histopathological result was Neurofibrosarcoma – malignant mesenchymal neoplasia . This type of tumor could reoccur even after a full surgical removal because of the formation of microsatellites. The localization of this neoplasia is interesting. Usually this tumor grows at the level of brachial or lumbosacral plexuses and it is very uncommon to be found within the spinal canal. Additional treatment was discussed with the owner. Usually in such cases radiotherapy could be beneficial ( but not available in Bulgaria ) . Additional metronomic chemotherapy with doxorubicin , cyclophosphamide and vincristine , very often in combination with NSAID , could be possible option. 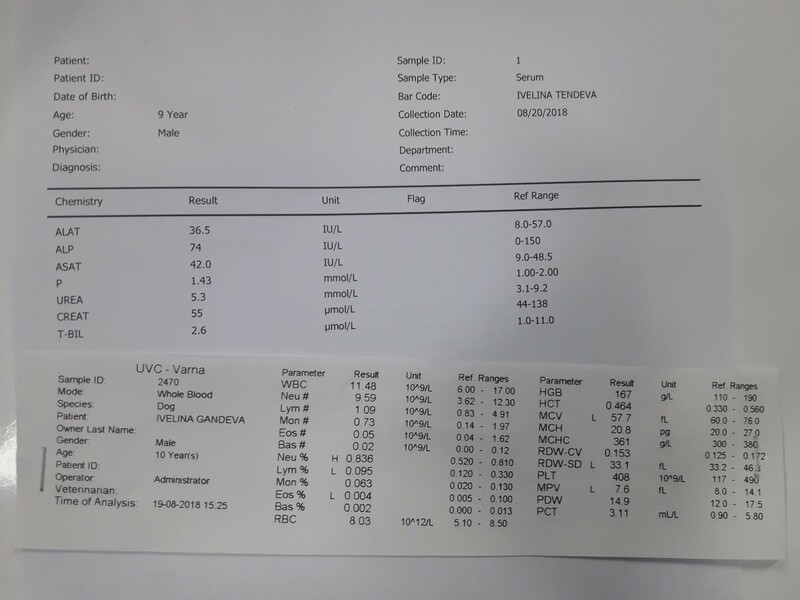 In this case i suggested a combination with NSAID , Meloxicam at dose 0.1mg/kg , Cyclophosphamide 10-15 mg/m^2 q 24hours per os , but the owner declined the second drug, so the dog stay only on meloxicam only. Unfortunately , two months later the dog came with clinical signs with the same neurolocalization. 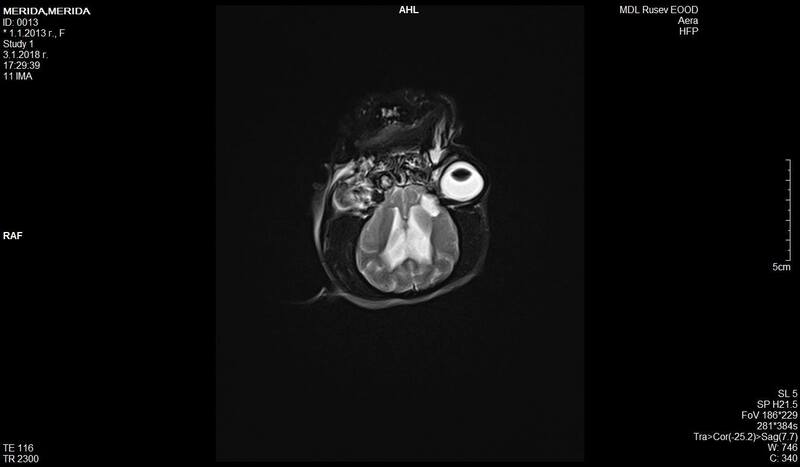 A new MRI examination and surgery afterwards were suggested to the owner but he declined. 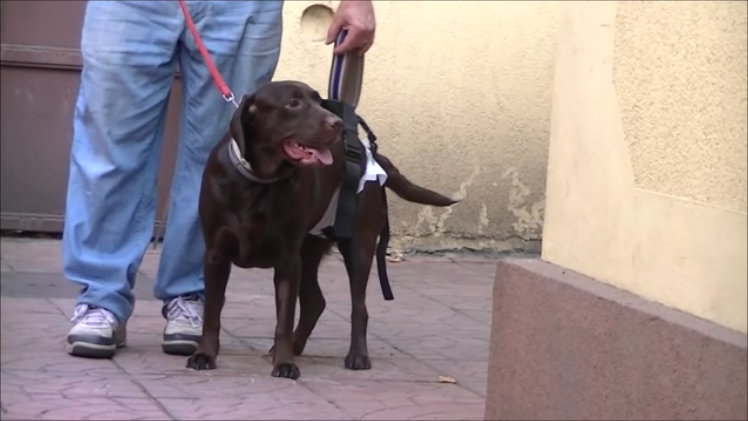 He ordered a wheelchair for the dog , to improve her mobility for a short period. 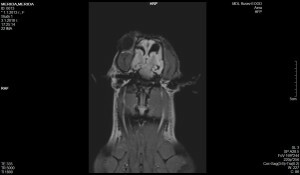 The prognosis of neurofibrosarcoma is guarded. 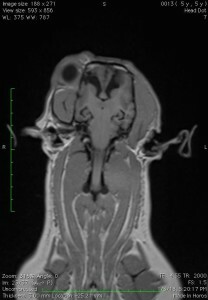 The recurrence of the neoplastic lesion could be expected despite full surgical removal. The usual localization of this neoplasm is within peripheral nerves but sometimes it could be localized inside the spinal canal and look like an intradural extramedullary lesion. The best treatment option is surgical removal and radiotherapy afterwards.